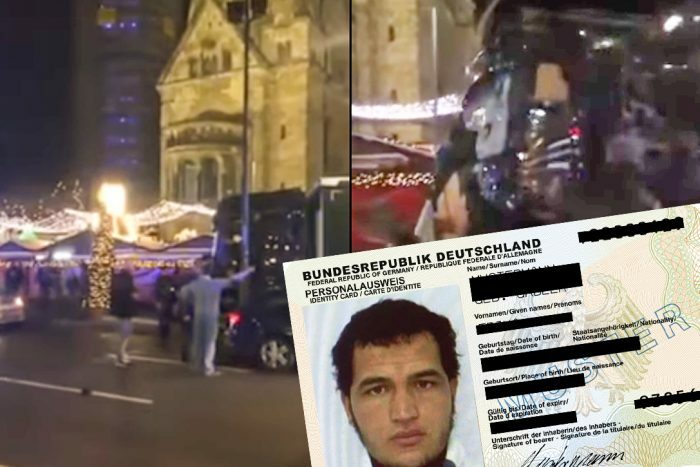 Berlin – Another False Flag? Government Complicity? Part of New World Order Agenda? 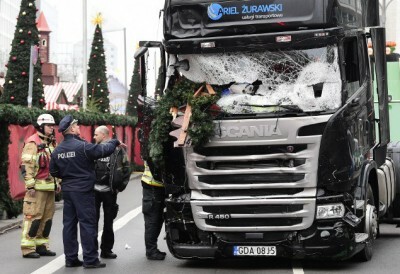 12 dead, about 40 injured, is the result of the latest terror attack in Berlin, when on 19 December, a truck plouged into a Christmas market at Berlin’s Bretscheideplatz, near the lush Kurfuerstendamm. 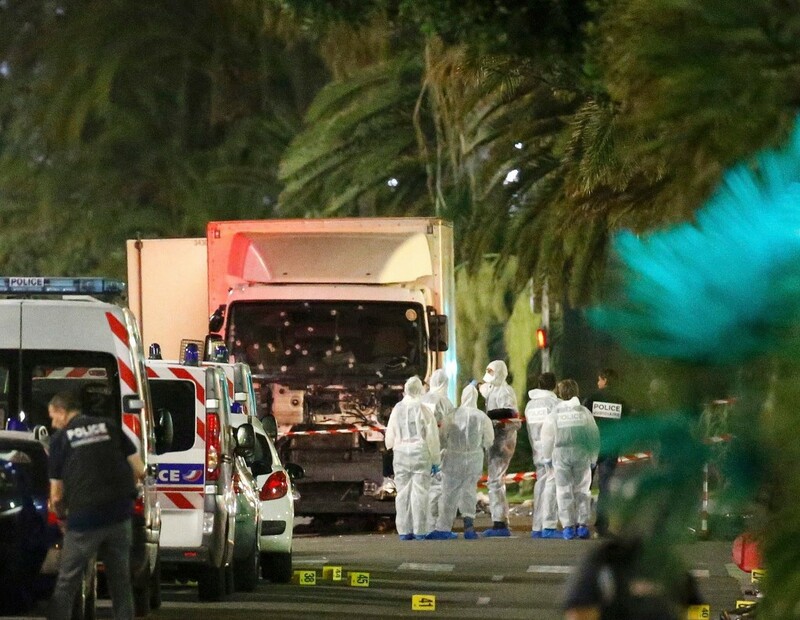 Is it not a ‘déjà-vu’ of not even half a year ago, when in Nice, France, on 14th July a truck mowed down hordes of people celebrating Bastille Day? In Berlin, the first ‘culprit’ was a Pakistani who apparently ‘escaped’. When later he turned up and explained with proof his innocence, they had to let him go. In the cabin of the truck they also found a dead man of Polish origin. He couldn’t be accused, since he was dead. Then the chase was stalled, until miraculously, about a day later, they found in the truck identity papers of a Mr. Anis Amri (24) of Tunisian citizenship beneath the driver’s seat. As is usual with these terrorists, they like to leave their ID cards behind. It seems to be part of their strategy to be caught and killed. Then, once more there was a ‘suspect’, who could be chased, throughout Europe. 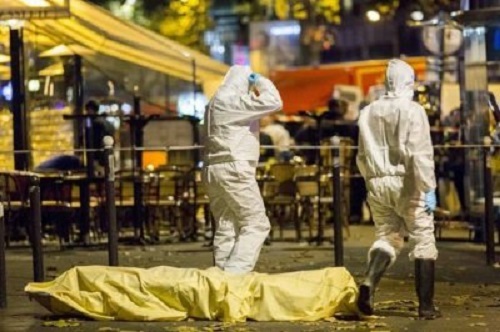 At three in the morning of December 23, again miraculously, Anis Amri turned up on a plaza in Milan, got allegedly into a confrontation with two policemen, who claimed he pulled a gun, when one of them shot and killed him. No witness, no proof. Two Italian policemen killed a young man, whom – they say – they didn’t even have a clue who he might be. They became heroes, literally overnight. Italy’s new PM, Paolo Gentiloni, thanked and congratulated them; and so did Mme. Merkel and her Interior Minister, Thomas de Maizière. The same pattern all over again. DEAD MAN CAN’T TALK. It’s Paris (Charlie Hebdo and Bataclan); Nice; Brussels; Munich; Orlando, Florida; San Bernardino, California …… all over again- and again – and again. The ‘plowing-through-a-celebrating-crowd’ is in many regards “a carbon copy” of the 14th July massacre in Nice (see image below). At the end, the designated ‘Muslim’ terrorist was killed. No witness. No testimony. Questions to be fully investigated: Were the secret services, the core of which are the CIA, Mossad and MI6, with the collaboration of Germany’s BND involved. Was it a false flag? Don’t believe one minute that your respective governments didn’t and don’t know what’s going on. Who are the real perpetrators? The real perpetrators are not Muslims. They are your own spineless puppet governments, all of which (covertly) support the ISIS and al Qaeda. They obey orders to demonize the Muslim faith and society. That’s what the west knows best – denigrating and discriminating, accusing the innocent, to serve their purpose, sanctions for those who do not submit. In reality, no change for the last 800-some years, colonizing, exploiting, murdering the people of Asia, Africa and Latin America. Today’s ‘leaders’ are the descendants of the colonial era killers of times past. They form the core of our “western killer civilization”. These western ‘leaders’ are mere puppets, because they have been put in ‘power’ by the the elusive elite, also called the “Deep State” – the Deep State gone global. Democracy is dead. It’s become a useless defunct slogan. No so-called election over the past decade or so, in the western world has been democratic. They were all scams and manipulations of peoples’ minds and wills. And if they didn’t conform to what the Washington masters and their supreme masters needed, Plan B of ‘regime change’ kicked in. They have become experts of semi-clandestine ‘regime change’ through parliamentary coups – i.e. Paraguay, Ukraine, Brazil, Greece, Portugal, Spain and many others. If these eventually ‘elected’ western leaders (sic-sic), from Obama, to Merkel, Hollande, May, Gentiloni – and the entire EU / OECD clan, don’t behave, they are ‘cooked’, the target of political destabilizaion. That’s the extent of impunity which drives this hegemonic and criminal process towards the New World Order, or the One World Order, led by the global finance and war industry. The finance clan, the lords of money, the Rothschilds, Rockefellers, Morgans, et al, the FED, BIS (Bank for International Settlements, the secretive central bank of all central banks) and Goldman Sachs, have to act fast; otherwise they might lose the key instrument of their power – the sham dollar pyramid economy – may fall apart, before they have actually reached their goal – a world under constant chaos, never-ending conflicts and wars. A world under which a small elite, enslaves the 99.99% of ‘Us, the People’ — under ever worsening life conditions, unemployment, misery, disease, privatized social services, all contributing to a steady decline in life expectancy. Among their instruments is permanent chaos. Economic dislocation and social crises. What does all that have to do with the Berlin massacre? – Everything. Berlin, like Paris, Brussels, Munich, Orlando… is just a cog in the wheel of the monster’s drive towards full world hegemony. Unexpected, haphazard carnage and terror acts are spreading misery, poverty and fear. People who are afraid will call for more police and military protection. They will voluntarily give up their human and civil rights for what they hope will be more ‘protection’, being totally oblivious to the fact that the very governments from whom they are seeking more protection are those that commit these acts of treason and terror, those who are behind the killings. The Anglo-american controlled presstitute mainstream media is in permanent brainwashing mode. Unless you search the news and information for yourself on alternative media, they will never tell you the truth, but their lies, after lies, after more of the same lies will fabricate the public truth. The goal is to include it into the French Constitution, basically putting the French people under permanent actual or threat of Martial Law. Others might follow – Germany, Italy – all those whose constituents are ever warier of the EU and their ‘monopoly money’, the euro, and who may seek EUREXIT. This would break the camel’s back, so to speak, or at least put a wrench in the boundless onslaught of the hegemon. Imagine, your own spineless governments, following orders of the globalized Deep State – in Berlin, Munich, Nice, Paris, Brussels, Orlando, and an almost endless list of false flags. How can we respect our so-called leaders? They have zero esteem for us, who are their bread-earners. They kill us, no hesitation, if it pleases them and serves their purpose – and their greed. In the case of Berlin, is the German government complicit? Blaming Muslims, finding a pre-identified victim, Mr. Anis Amri, who most likely had no clue that he was framed. In Italy, the police catches him (or somebody who has been given the pre-identified Tunisian victim’s name), they kill him – and, bingo – case closed. Another fear-inflicting false flag was born and concluded, advancing the bulldozer of empire’s destruction a notch closer to Full Spectrum Dominance. The MSM will do the rest – until the next fake exploit. Be prepared. But this can happen only if we let our governments get away with it, if we close our eyes to reality; if we keep believing the presstitute media.